We’re not only known for the tougher than tough and stylish as ever watches we produce you know, we also know how to put on a decent night. 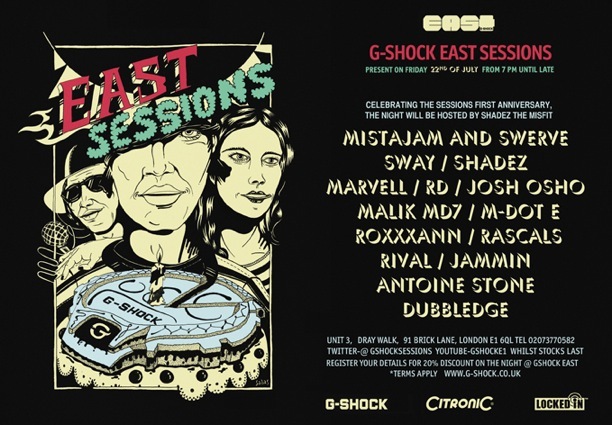 Over the past year we’ve consistently showcased an array of up and coming homegrown talent from the world of grime, hip hop and dubstep down at our Shoreditch store, G-Shock East. In celebration of the session’s first anniversary last Friday the line up was A LOT; Mistajam provided us with serious dubstep stonkers whilst Swerve mixed it up blending US and UK vibes keeping the crowd hype in between the artists taking to the live stage. RoxXxan fully repped for the Backpack Gang alongside fellow Brummie Malik MD7, who spat a whole lot of realness. Lets not also forget soon-to-be chart stalkers, singer/songwriter Josh Osho and girl group RD, whilst Sway and newcomer Mdot-E dropped some serious hip hop flavas. 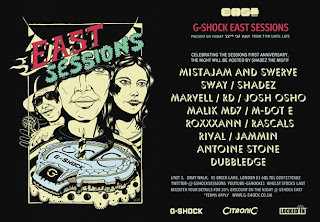 Make sure you follow @gshocksessions for information on the next event and check the pics below of Swerve, RoxXxan, RD, Mdot-E and Mistajam swagged out in their new G-Shocks!